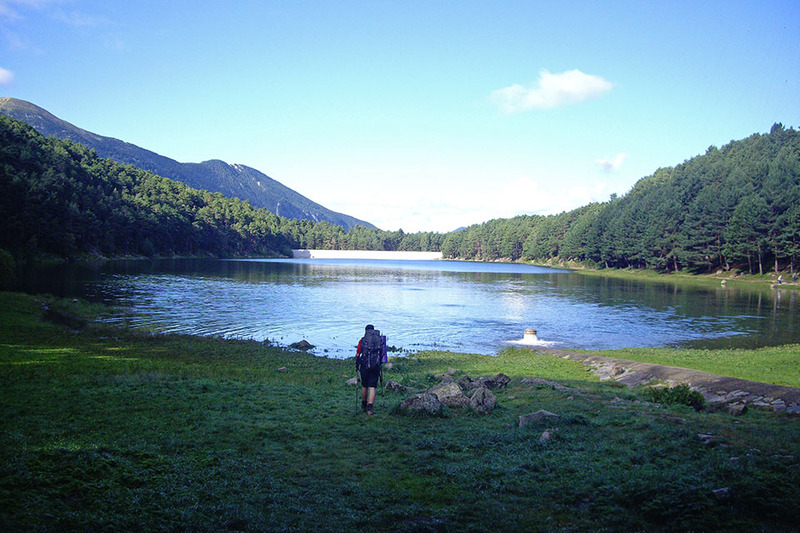 ﻿ Etapa 33 del GR11 entre Encamp y el refugio de L'Illa. Difficulty: no difficulty, except for the elevation. Water: you will find water throughout the stage. At first you will see drinking fountains, then later you will follow a river. 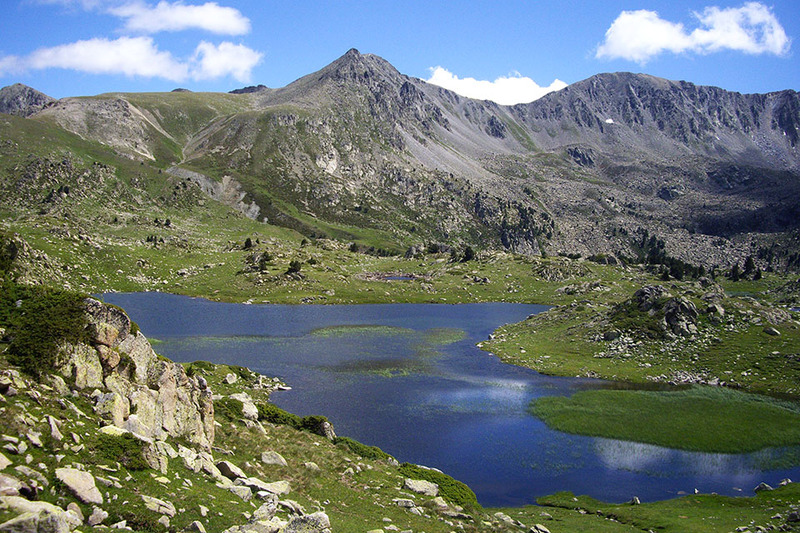 (1h10min; 2.3kms) Llac d'Engolasters (1.630m). There is a small car par and a couple of bar-restaurants. Follow the track, passing the lake on your right. At the end of the lake, the track becomes a surfaced road. Soon afterwards the road forks left, and you continue to climb up to an old cable car station which was left abandoned in the 1980s. Follow this narrow road until you come out at another wider one. 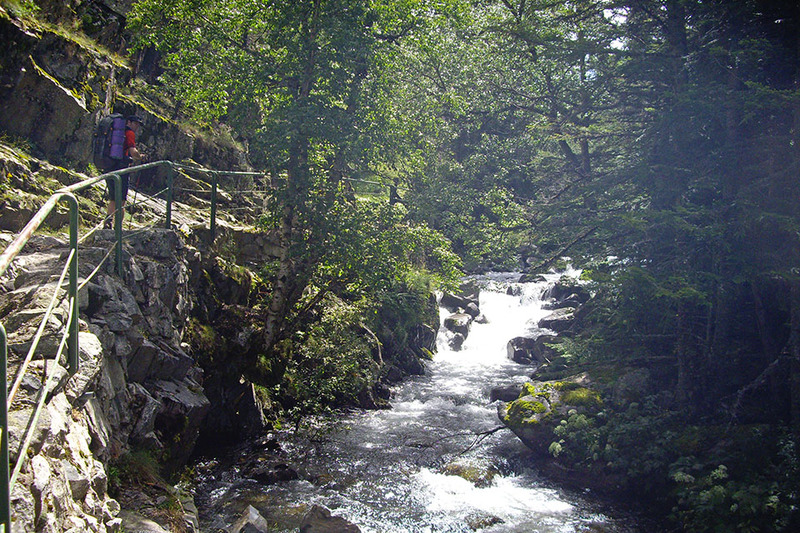 (1h30min; 2.3kms) Aparcamiento de les Fonts (1.638m). There is a Tourist Information Office and a bus stop. 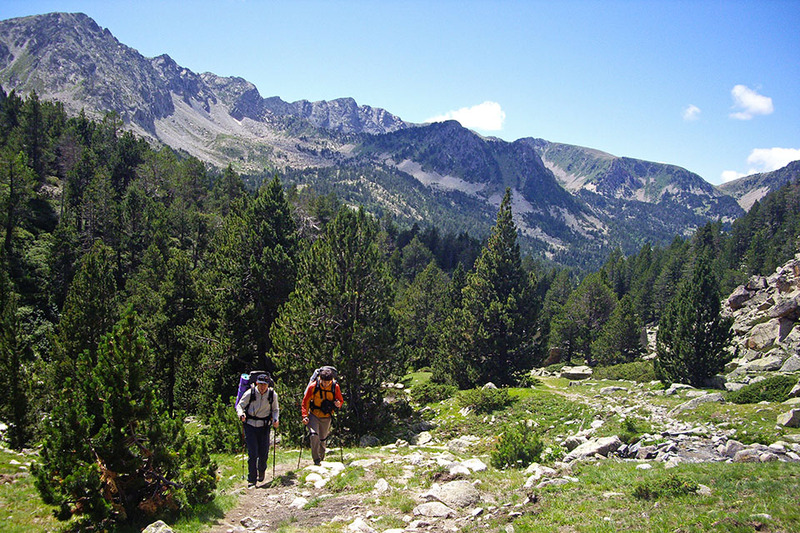 The GR11 continues past the tourist office, while following the same route as the Camí dels Matxos, a local walk with yellow markings at the beginning. 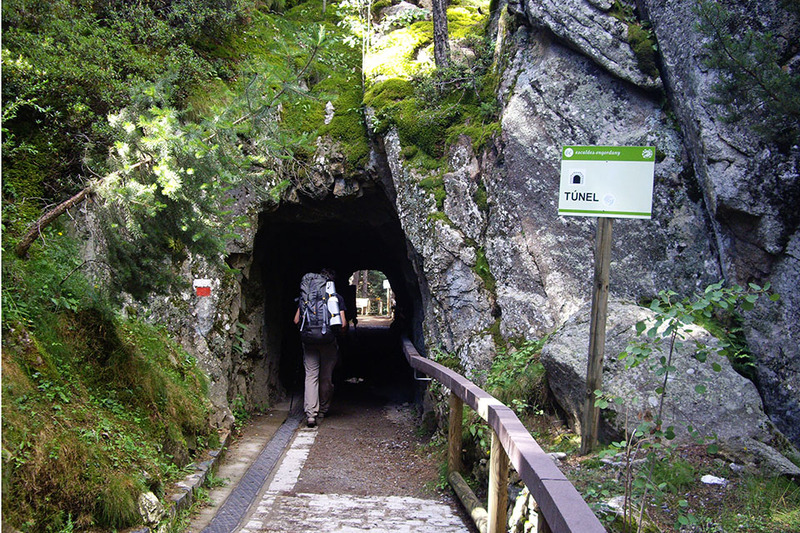 Further ahead it crosses a small tunnel and passes a panoramic view point on the right. 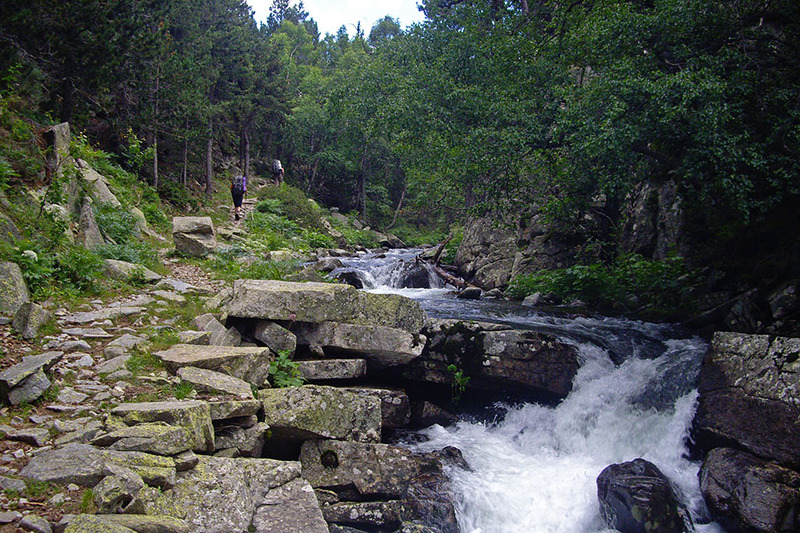 You pass the Font de les Molleres and reach the picnic area where there is a small rock-climbing school, an area for shelter and a drinking fountain (dels Corralets). From this point on, the path begins to climb. 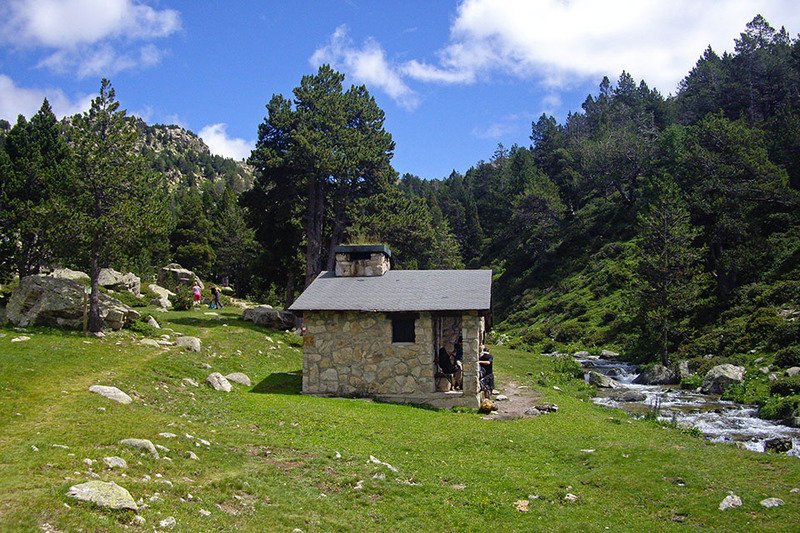 (5h05min; 16.0kms) Refugio de L'Illa (2.480m). 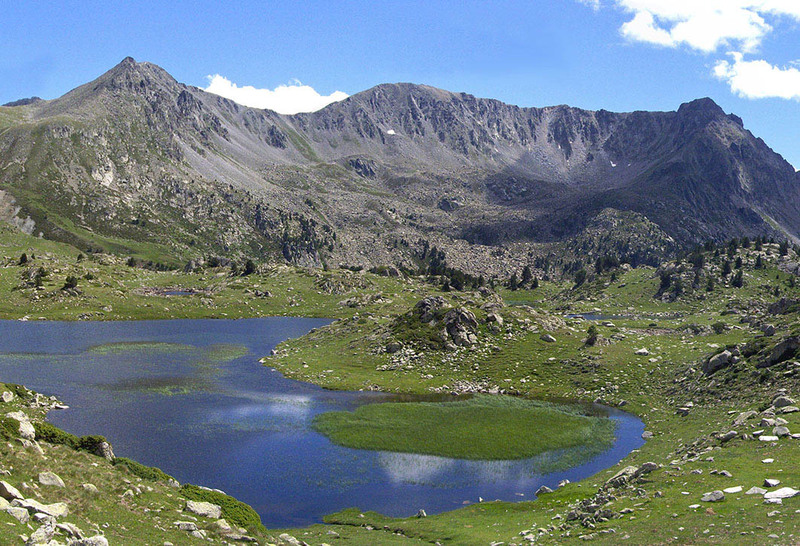 - Alpina: Andorra (Scale: 1/40.000). - Rando editions: Andorra - Cadí (Scale: 1/50.000). 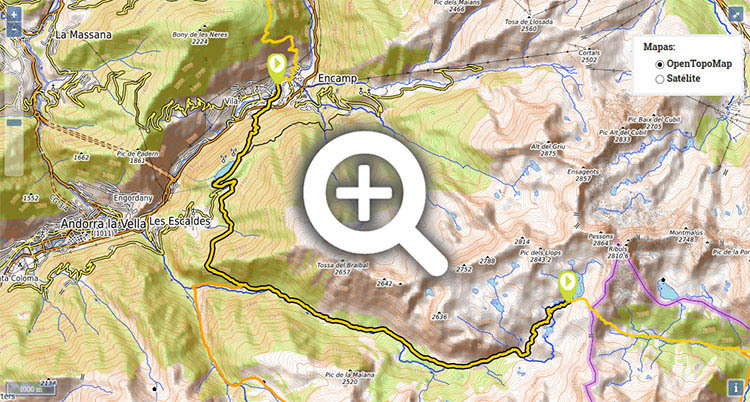 In Encamp there is a choice of accommodation to suit every budget. Close to the centre, and for a reasonable price, you have Hotel París or Hotel Guillem. Throughout the stage you will find a number of free shelters. 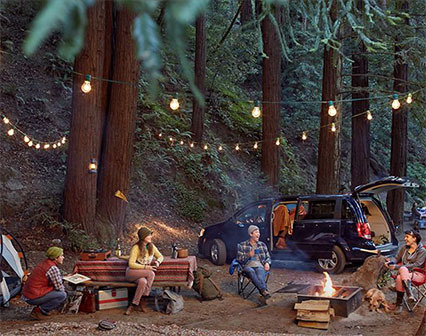 At the Dels Corralets picnic area there is a covered space where you could take shelter. 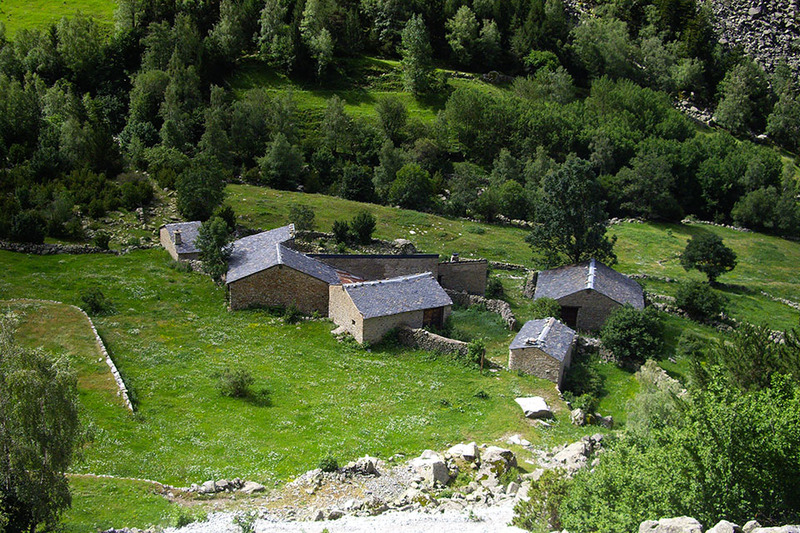 In Cortals de Ràmio there is a house by the path used by livestock which could serve as a shelter in case of emergency. 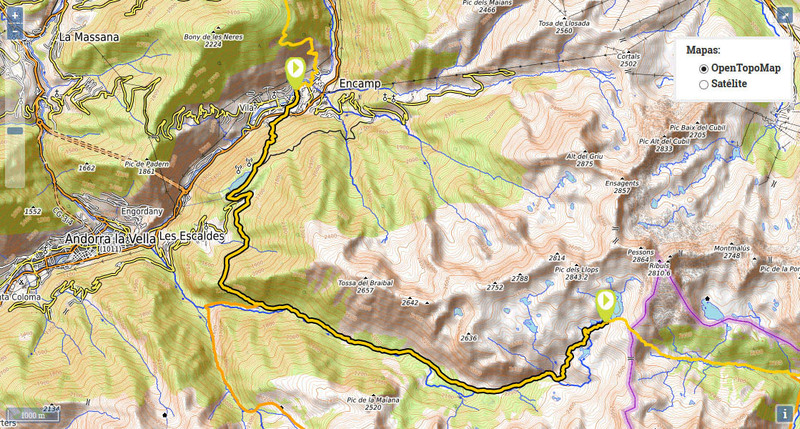 After that, there is a closed building and further on, Refugio de Fontverd (free, clean, gas cooker, running water). Following the Madriu valley for 20mins, there is Cabaña de la Farga (clean but without commodities) and beyond that, Cabaña del Serrat de la Barracota (not in great condition). 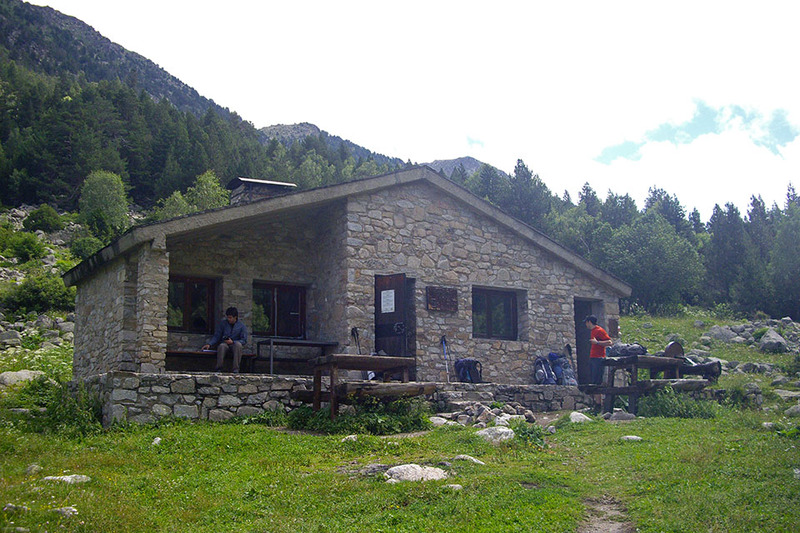 After another 20 minutes you come to Refugio de Riu dels Orris (clean, small). Later on there are another 2 cabins in poor condition. 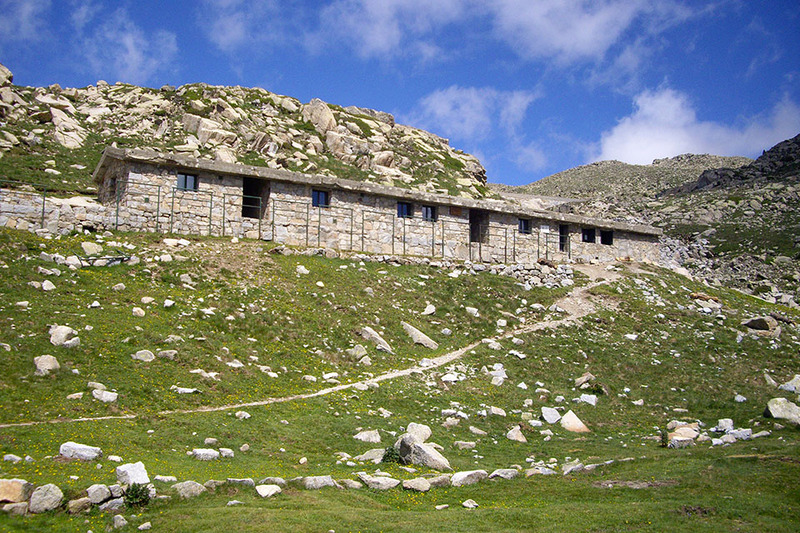 At the end of the stage, Refugi de L'Illa	(/). In Encamp you will find practically everything. A post office, a chemist’s, sports shops, a health clinic, banks, bars and restaurants, etc. One option is to take the bus route Puigcerdà-La Seu d’Urgell–Lleida (Alsa ()). 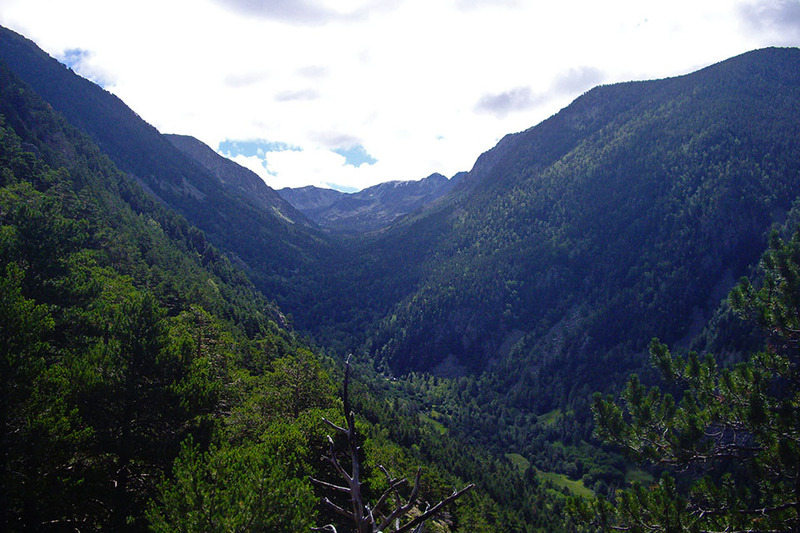 There is also a daily transport service between La Seu d'Urgell and Andorra (Grup Montmantell ()). From Monday to Saturday it runs 28 times a day, and on Sundays, 10. 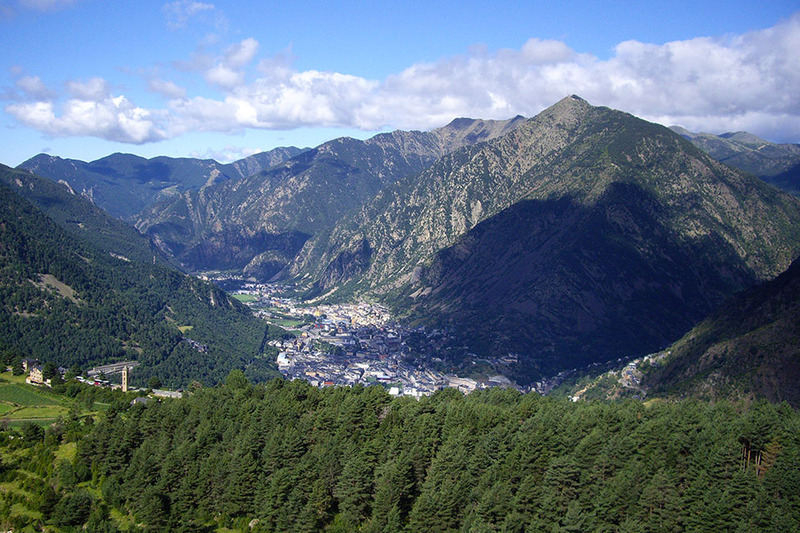 There are regular bus routes from Andorra la Vella: Movilitat i Transport Públic: L6 Andorra la Vella-Ordino and L2 Andorra la Vella-Encamp.